Denis grew up in a sociable family, in a house with open doors. In 1997, he went to India where he spent seven years. His quest for beauty and deeper meaning brought him to study classical Indian music under the guidance of Sri Parashuram Pandey. After several long solitary periods in a little house in the Himalayas, Denis met teachers who inspired him, such as Christopher Titmuss, Jaya Ashmore and Ajay Singh. Since 2006, he has been teaching in Spain, France, Holland, Austria and India. His approach to meditation, based on our capacity to observe, is simple and avoids any belief system. His practical path, neither extravagant nor complex, invites our honest and open exploration. He teaches us to pause our daily routine and to observe ourselves calmly and without judgment. His simple approach develops our self awareness, self knowledge and the ability just to be. He is a teacher of the Dharma Nature association, and seeks to simplify the approach to meditation to make it more accessible and integrated into daily life. 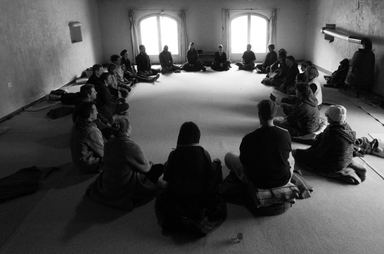 If you want to discover the other style of retreat with Denis, visit the Dharma Nature website. The teachings are based entirely on the observation of our experience. No belief system is required. In fact,to learn to become the observer of our experience, we must rid ourselves of preconceived beliefs and ideas. We must learn to stay in touch, moment by moment, with what is present, without engaging in judgment or interpretation, without using our thinking mind. We spend the days practicing this. We learn to bring our attention to what we perceive in the moment. When there are thoughts, we learn to disengage. Gradually, intuitively, the difference between "perceived" and "interpreted", between "being attentive" and "thinking", becomes clear. Without even realizing it, our perspective changes, our thoughts are less stressed, less stimulated, and even if they sometimes remain plentiful we are less "caught up" in it. We become more sensitive and more in touch with what we are experiencing and what surrounds us. we listen. And we wait. Then, the movement rises, the irresistible urge to dance returns and we dance again. touch with what IS, and attach less importance to our interpretations. Each situation calls for a fresh response, balanced, independent from our habitual patterns, our ideas and misunderstandings, our impulsive and destructive reactions. Gradually we understand what it means to 'be free'.